Most people in Philadelphia for this week’s Democratic National Convention likely don’t realize that when they’re driving between the Walt Whitman and Ben Franklin bridge exits on Interstate 95 they’re on top of a home site. That underpass can be one of the safest places in the city for Philly’s homeless to stay. Like in Cleveland a week before, the city’s deepest scars are temporarily masked by the pageantry that comes with the nomination of the potential next president. But walk through the I-95 underpass at night and you’ll find a haven for forgotten souls. The other night there were 30 people here – black, white, Latino, men, women – the only commonality is where they rest their head. Empty Target shopping carts are filled with comforters, clothes and groceries. Cracked beer bottles spew across the pavement along with the occasional needle. They barter cigarettes from one another. Yell at one another. Laugh with one another. Cry with one another. Standing outside the Wells Fargo History Museum on South Broad Street is a man who only identified himself as Conrad. His shirt is stretched. His jeans are baggy. His shoes, a vintage pair of Kobe Bryant Crazy 8 adidas sneakers, are tattered. He snacked on popcorn and a bagel and sipped on a water I purchased from a nearby coffee shop. Asked how it feels to stand out here, he shut down. Conrad looked at his shoes, stared briefly into the sky, a single tear dropped down his face. He walked away. Conversation over. 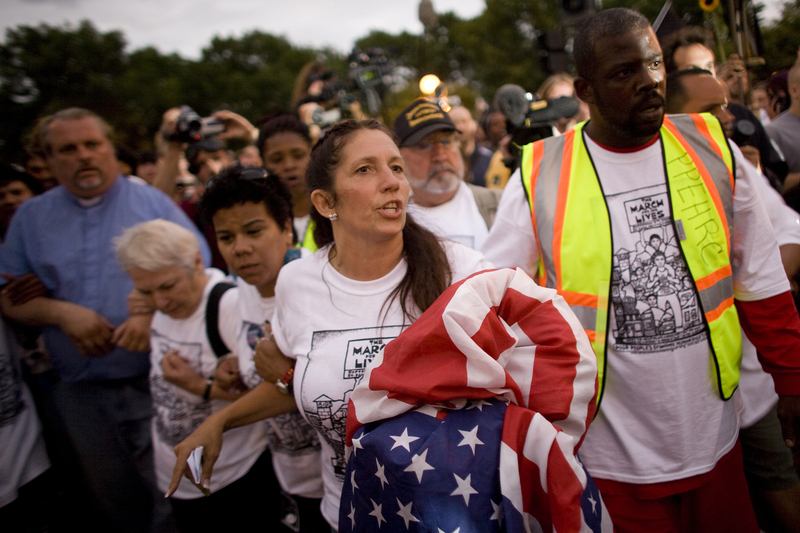 Cheri Honkala is national coordinator of the Poor People’s Economic Human Rights Campaign. She’s been an organizer for 30 years. Poverty hits home for her because, many years ago, it was all she knew. Honkala and her oldest son, actor Mark Webber, slept many a night in their car during sweltering Philadelphia summers and frigid winters. Cheri Honkala (C), National Spokesperson for the Poor People’s Economic Human Rights Campaign leads a protest outside the Republican National Convention (RNC) at the Xcel Energy Center September 2, 2008 in St. Paul, Minnesota. She sits, frustrated and distracted, in a Starbucks inside the lobby of a downtown Hyatt. She is preparing for the March For Our Lives on Monday afternoon to protest the money spent on hosting the convention instead of helping the city’s most vulnerable citizens. A few minutes earlier, while participating in a panel discussion at the William Way LGBT Community Center on poverty, LGBT rights and other progressive issues, she learned the city had attempted to evict several families she helped find shelter for the night before. Honkala, the 2012 Green Party nominee for vice president, says such extreme poverty isn’t limited to a single race, generation or neighborhood. For Philadelphia residents who see the streets every day, progress can be hard to see. But Mitchell Little says it’s happening. It’s his job to inspire hope and provide results as the executive director of the Mayor’s Office of Community Empowerment and Opportunity. The organization has been around in various iterations since the War on Poverty began 52 years ago. And he argues that Philadelphia has achieved some tangible results, even if they don’t all reach the I-95 underpass. “I think the city is doing more now than it has in a long time,” Little told The Undefeated. The CEO office has created partnerships with academic experts, nonprofit organizations, anti-poverty services. Little said his office completed approximately 13,000 applications for benefits last year, creating an opportunity where residents could apply for up to 21 programs at once. They helped Philadelphians gain nearly $10 million in earned income tax credit. And had about 7,000 people take advantage of its financial empowerment centers. 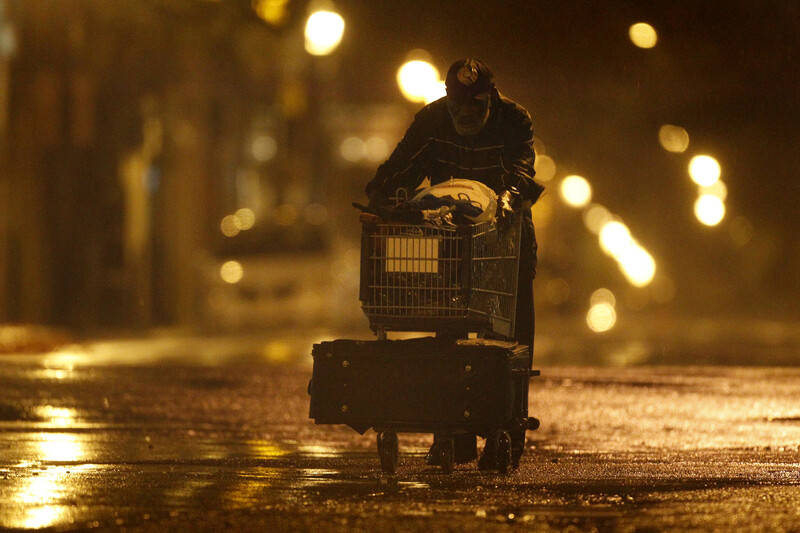 Lenard Sanders, a homeless man, pushes his cart toward a subway station to seek shelter as Hurricane Irene makes its way along the Eastern Seaboard, Sunday, Aug. 28, 2011, in Philadelphia. He sympathized with residents and activists who fail to see the glass half full the way he does. The city isn’t doing enough, he said. Neither is the state or the country. But it can’t be just the government’s responsibility. The distance between the underpass and the Wells Fargo Center is only a 15-minute drive, but the two areas are worlds apart. One community intends to map out the course for an entire country over the next four years. The other is attempting to navigate the next four hours. Honkala is almost finished with her frappuccino. She has to prepare for the afternoon’s march. Asked if the city of Philadelphia has given her any hope that positive change is on the horizon, she smiled gently. Nope.